Can anybody guess what these are? So that little guy allows your pot to vent so it doesn’t boil over. Isn’t that adorable? As soon as I saw this I knew I found the perfect Christmas gift for my women co-workers.Below are my steps if you want to make your own. 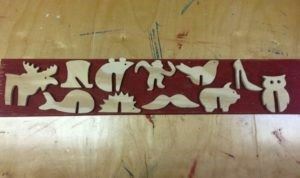 2) Then I used my Dremel scroll saw to cut each one out. Tip: For the hedgehog: draw a curved line that touches the top of each spike and cut along that line first (below photo) then go back to cut the spikes. It makes cutting those points easier. 3) I would just kinda guess at how high the slit needed to be. I would start small then test fit it on a pot I brought to the shop with me, then cut away more as needed. Remember: you can always cut more but you can’t cut less. I made each one about 1/4″ wide, but I was just free handing it. You might also have to play with how high you make the slit. You don’t want the lid of the pot kept too high off because it’s just meant to create a small vent. See how high I made the slit on the owl vs the bird? So just play with it as you’re making them. 4) To make the eyes, I drilled a hole with the drill bit I thought looked about the right size. The owl is 1/4″, where as the pig is 3/32″. These range in height a little bit…the moose is 2 1/2″ but the mustache is only 1″. It doesn’t matter as long as the gap it creates between your pot and lid work out to be a good gap. 5) Once I had my templates the way I wanted them, I went to a lumber supplier and purchased some 1/2″x 2 1/2″ solid pine. I went looking for solid birch or oak (the originals are made from birch) but I couldn’t find any that was less than 1″ thick and since I would be using my scroll saw, I needed it to be 1/2″ or less. 6) Now that I had my wood and my templates, I just started tracing then cutting. After I cut a few out, I would kick back and smooth out the edges with sandpaper then cut a few more out and repeat. Don’t be afraid to get creative! A few others I was thinking of are Atlas (guy holding the world on his back), Peter Pan flying, a beer mug, maybe a cowboy in the dueling stance with chaps and holstered guns….haha : ) Can you see this getting addictive? I wouldn’t use plywood. I thought about using all the scrap I already have in my shop but I bet the steam from cooking will break down the glue after a few uses and the layers will start separating. Instead go for something solid. To find solid wood that is already a 1/2″ you will have to find an actual lumber supplier because Home Depot and Lowes only sale plywood and 1xs. If you live in the Fort Worth area, Teague Lumber is a good resource. If you don’t, then search Google for “lumber supplier” and see what pops up. I bought two 8′ boards and was able to make 64 pot guards total. So that gives you a rough idea of how to calculate how much wood you will need to buy for the number you want to create. I looked into what type of finishing I could use for these guys and found that there are stain finishes that are FDA approved that would be safe to use around food. However, they have a tolerance rating of 130 degrees for wet heat (steam) which means if you put stain on these guys then put them around steam, the stain will come off. So my recommendation is to leave it natural and use an oil to seal it. I used mineral oil which requires frequent reapplications. I personally think the girls at work will love them. I think I might make a few extra and throw them in a few stockings this Christmas for my family too. : ) If you come up with some fun designs be sure to send me photos!